Language evolves and changes. Even people who believe language rules should be prescriptive (unchanging, based on choices from the past) rather than descriptive (based on how people actually communicate) still have to choose a point in time when their prescriptive rules are set in stone. Which is, of course, as subjective as anything else to do with how humans communicate with each other. Language is fascinating and living, and that requires us to understand that differences in word choice, pronunciation, grammar and so on are not deviations from the "one true way" - they all have some validity. We shouldn't try to stamp out varied dialects and accents and vocabulary, we should see that variety is what prevents stagnation. Accepting that alternatives exists prevents our minds from becoming closed. I wrote a bit more on that subject (and my support of Scots Language) here. Anyway, I shared the picture above on social media, saying "This is my favourite train station in the UK." For some bizarre reason it got seen and shared by more people than anything I normally say: over 120 shares, likes and comments just on Twitter when I checked just now. But amongst the guesses at what station I had photographed, there were many comments along the lines of "Argh, it is not a train station, it is a railway station, stop being American!" Oh boy. I can understand having your own preference, but this was prescriptivism in saying "only the way I say things is correct: I'm okay, you're not okay." Here's a shocker - in the UK, 2018, train station and railway station are synonyms, and can be used interchangeably. "Where are the UK's busiest rail stations? And how many people use them? We bring you one of the best datasets available about each of the train stations we use." "Did you know the UK is home to 2,563 train stations? [...] From these railway stations, travellers can catch a connecting service with train operators such as ..."
So the terms train station and railway station refer to the same thing. Individuals will have their own preferences as to what term to use based on what they grew up with (cf. napkin/serviette). So the preference can be a regional/class/cultural thing. I grew up in the 1970s North, and I never heard anyone say "railway station" - it would have sounded to us like someone was putting on airs. To me it was a station for trains to pull into, independent of whatever they said in the US. That last point is important too. The alternative names for the same thing didn't necessarily come from two different countries. So how did they come about? Well, if you look at the terms railway station and train station, they are both missing prepositions. As such, a preposition has to be assumed - and the preposition you choose to assume determines what word pairs with station. If you assume the missing preposition is "on", then you will probably say railway station = "station on a railway". Makes sense - you wouldn't say "station on a train", so "train station" seems wrong. BUT! (There's always a but ...) If you assume the missing preposition is "for" then you will probably say train station = "station for trains". That makes equal sense - you wouldn't say "station for railways". So both cases depend on an assumption, a thing selected to fill the gap, and there are two equally likely and correct possibilities. The one you choose determines whether "railway" or "train" is the correct pairing for "station". There, hopefully that's explained that both terms are equally valid, and also where the two options probably evolved from linguistically. Neither are created from a position of grammatical ignorance. Just use whichever you feel more comfortable with. Why Do I Love That Station? Let me end with something positive and answer the question above. I chose not to own a car, so get to most places by train, bus, bicycle, walking or running. It means I have an affinity for train stations. But only nice ones. Many train stations are dirty grey places packed with consumerist chainstores selling things in throwaway packaging, and where you have to pay to use the toilet. I also hate train stations where there are restrictions on going onto or leaving the platform (e.g. Shrewsbury, Manchester or Cardiff, where you have to pass through barriers and show tickets - meaning you can't wave friends and family off, or easily pop out of the station during train changes). None of that applies to Dumfries railway station. It gets full marks for having free toilets, and free water bottle fillers on both platforms. There are nice buildings with quaint features, and a small display of historical items. There is storage for bicycles, and the area is also used for local food markets once a month, which is a great use of space and makes the railway station a part of the community. There are no restrictions on going onto or leaving the platform, no barriers saying you are unwelcome. There's also amazing greenery thanks to Incredible Edible Dumfries and the South West Railway Adopters Gardening Group (SWRAGG), who both do fantastic work. Last time I met someone from the train I had time to wander round the gardens, and I picked a few things to take home (something Incredible Edible encourage): some fennel and lemon balms to use in making cups of herb tea, some chives for on my pasta, and rosemary that I roasted with garlic and potatoes. Next time I'll snip a couple of stalks of rhubarb and a few remaining crab apples, and stew them together. All for free. 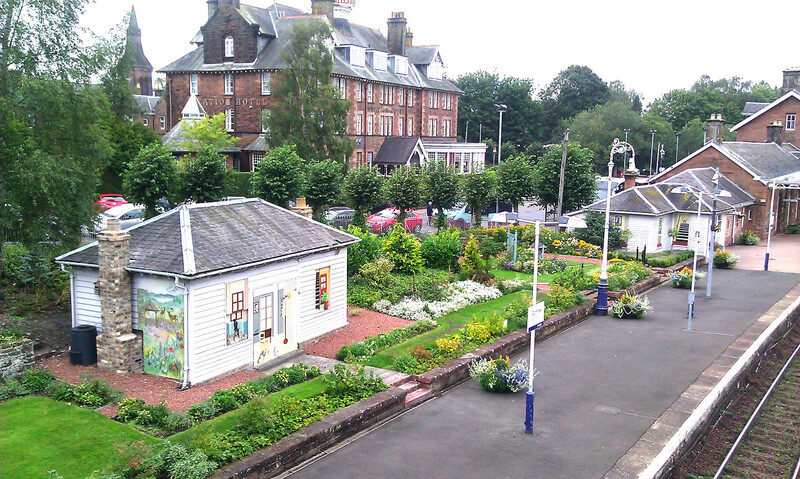 Plus I love Dumfries in general (you can read about my move to Dumfries here). For anyone wondering about the charmingly-painted building in that first photo: it was a store building, then became disused. A local artist painted murals there and elsewhere (I'll try and update this later on, with a link to her work). 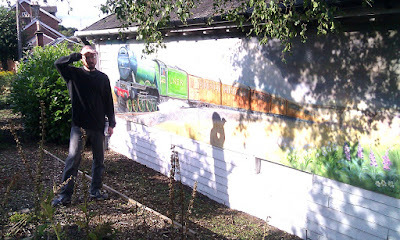 Round the back of the building there's a mural of the Flying Scotsman. I was indeed going to call you a hypocrite as you do get uppity about other uses (or mis uses) of language! However, in this instance, I think you're right, the word chosen tends to be based on age, background, preference and geography.